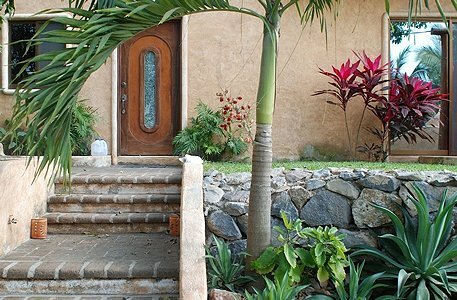 Located just 5 minutes from the beach is this beautiful 3 level home with two street access, secure parking, and a beautiful ocean view palapa (R-8 on the map). The top left photo is the home as seen from the large grass yard. 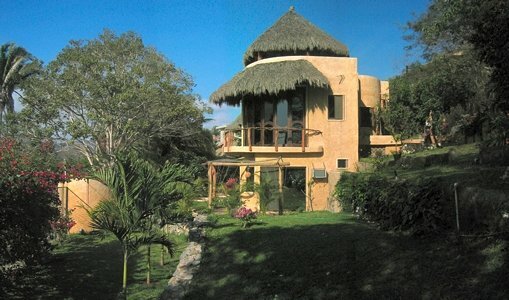 The entire property is completely landscaped with beautiful trees and flowers. Top right is the fully equipped kitchen which is connected to the living area so no one misses out on the action. Lower photo is the living area. Starting left to right there is a one of kind dining room table custom made from large slices of tree trunks. Next is a 1/2 bath, a water feature which gives a nice sound of running water, then a comfortable seating area in front of doors which fold open all the way so the living area is directly connected to the outdoors. Next is a comfortable seating area with satellite television.